Many features of Ascolog Insight can be adapted to your requirements. 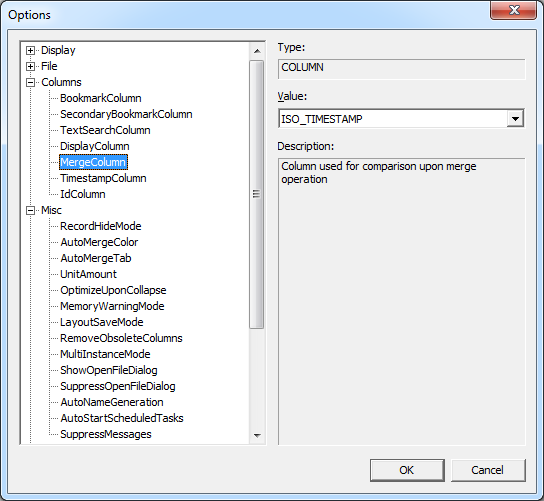 In order to change the configuration of features open the Tools menu and select Options... to open the Options dialog shown in figure Options dialog. Options can be valid only for a single layout or for all layouts (i.e. application-wide). In order to change an option select the option in the tree on the left side of the Options dialog and select it. The options are organized by their purpose in categories (e.g. Display, File, Columns, etc.). The details of the selected option are shown on the right side of the Options dialog. In the details you can configure the option by changing its value in the Value drop down list. For more information about an option please have a look at the Description field. For some options you can find additional information in this documentation in the chapter related to the option.